Guilt inevitably afflicts all expat parents when they relocate their families around the world. Despite the enormous advantages and privileges growing up as a global nomad, it’s sometimes hard to reconcile this with an unhappy child, distraught at the prospect of leaving friends behind and moving country yet again. 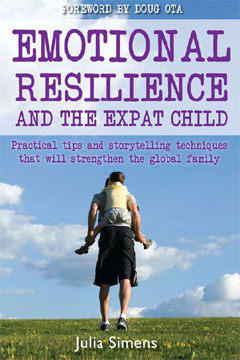 Emotional Resilience and the Expat Child seeks to help parents prepare children for their adventures abroad and ensure they can express and articulate the complex emotions at work when relocating. Julia Simens is an American educator and consultant with a focus on international relocation and in 20 years of living in five different continents she has helped many children and families adjust to their global lifestyle. Identifying key emotions at the root of distress and teaching children to communicate these feelings in words and pictures, helps youngsters confront the emotional difficulties as they learn to cope with each transition. To accompany the theory, Simens has included practical exercises throughout the chapters for both parents and children to work through. This is a book that will appeal to parents with an interest in the psychology of raising children overseas, and using this knowledge to help them cope with the emotional upheaval of leaving things behind and packing up to move on again.